Obando, officially the Municipality of Obando, (Tagalog: Bayan ng Obando), is a 2nd class municipality in the province of Bulacan, Philippines. According to the 2015 census, it has a population of 59,197 people. 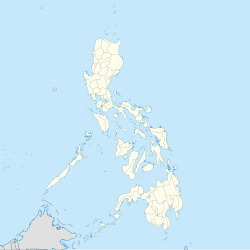 It is 16 kilometres (10 mi) away from the Philippine capital Manila and is part of Manila's conurbation which reaches San Ildefonso in its northernmost part. In the 18th century, the municipalities now known as Meycauayan, Valenzuela (formerly Polo) and Obando comprised only one town, the Municipality of Meycauayan. The town of Polo and Obando, formed a barrio called Catangalan. In the year 1623, the municipality of Polo was organized which included the present-day territories of the Town of Obando. By virtue of a decree promulgated during the time of Governor and Captain General of the Archipelago, Francisco Jose de Obando y Solis, the town was created and separated from its mother town Polo on May 14, 1753. In the Governor's untimely death at the hands of the British during the Seven Years' War, the creation and establishment of the town was made and attended by the Alcalde Mayor of the province, Don Francisco Morales y Mozabe, the Provincial Minister, S. Gregorio, Rev. Fr. Alejandro Ferrer, together with numerous religious devotees. The minister who was chosen to administer the town was Rev. Fr. Manuel De Olivendia. In 1907, Obando was made an independent town of Bulacan. Then through the untiring efforts of the municipal officials, a portion of Gasak, Navotas was reclaimed to form a part of Obando. The municipal officials, believing that this portion was once a part of the municipality but was adopted by Navotas in the course of time, effortlessly pushed through its claim to regain the area. The concerted action of all those concerned paid off when on January 30, 1975, by virtue of a Presidential Decree No. 646, a portion of approximately 1.78 square kilometers of Gasak, Navotas was returned to Obando. This is mostly fishpond and sandy beach and believed that when fully developed, this will serve as a good tourist attraction. By resolution of 1975 Municipal Council, the area was made into a barangay and named it Nuestra Señora de Salambao in honor of one of its patron saints. Obando is bordered by Valenzuela City in the east, Navotas City and Malabon City in the south, Bulakan in the north, and the waters of Manila Bay in the west. Flat and low-lying coastal plains characterize the general topography of Obando. The area was formerly an estuary, but it filled up partially from the peripheral parts of each sand bar and sand spit and formed up into current figure that mainly consisted of commercial district, partly industrial district, residential area and fishpond. Within the municipality are two rivers and three creeks namely Meycauayan River, in the north, Pinagkabalian River, in the south and Paco Creek, Hulo Creek and Pag-asa Creek traversing the town parallel to the provincial road. Obando, just like the other towns of Bulacan, has two pronounced seasons: dry and wet season. The wet season is from May to October and the dry season is from November to April. The rainfall of the wet season accounts for about 80% of the annual rainfall, which is due to west monsoons and typhoons. Obando is politically subdivided into 11 barangays (8 urban, 3 rural). Barangays Binuangan (ancient "Binwangan" mentioned on the Laguna Copperplate Inscription which is the oldest written document of Philippines inscribed in Indianized script dates back to 900 CE) and Salambao are located along the Paliwas River, and can only be reached by means of motorized boats. In the 2015 census, the population of Obando, Bulacan, was 59,197 people, with a density of 1,100 inhabitants per square kilometre or 2,800 inhabitants per square mile. In 2002, Obando had an estimated population of 58,245 wherein 49% are male and 51% are female. Of the current population, about 14% live in rural barangays while the rest constitute the urban population. There are 12,349 households. The average monthly income of a household is P9,000.00, slightly below the P9,540.00 minimum for a family of 6 threshold set by Department of Social Welfare and Development. River pollution caused by the Tanza, Navotas dumpsite remains a problem. In 2002, under the leadership of Mayor Nesty Joaquin, the Sangguniang Bayan of Obando, Bulacan passed a controversial resolution allowing all the Phileco (Philippine Ecology Systems Corp.) barges that contains tons of Metro Manila's garbage to pass the river of Obando and dumped it in a river-turned "controlled" dumpsite facility in Tanza, Navotas which is only 1 km away from Obando. Mass actions followed but local officials failed to stop the dumping up to this date. Studies showed that the operation of the dump was polluting the river and had caused several diseases among residents, mostly old folks, women and children. The Obando Landfill poses a concern because of the possibility of flooding. Environment Secretary Ramon J.P. Paje has been asked to revoke the environmental compliance certificate that his department issued to a landfill project for aggravating the situation in Obando town of Bulacan. Coalition president Roy Alvarez warned Paje the flooding in Obando is proof that the fishing town is a flood-prone area and the construction of a sanitary landfill is a blunder. The threat of extreme weather disturbances due to climate change and constructing a landfill in a flood disaster hotspot like Obando, Alvarez said. Citizens’ groups, religious associations, an environmental health coalition and a fisherfolk alliance, had asked Paje to stop the construction of the 44-hectare landfill in Barangay Salambao in Obando. They cited the proximity of the waste disposal facility to Obando River and Manila Bay. The protesters said that the Obando landfill project is illegal and violative of the Ecological Solid Waste Management Act. They expressed belief the landfill will prejudice the health of Obando River and its people, worsen the decades-old flooding problem in the town, contribute to the deterioration of Manila Bay and destroy the livelihood of tens of thousands of people. The said project was approved without public hearing and backed up by its then Mayor Orencio E. Gabriel, councilors Aries Manalaysay, Dhey Alejo, Virgilio Cruz, Arvin dela Cruz, Edmon Papa, Jocelyn Gutierrez-Garcia, Bulacan governor Willy Alvarado. Businessman Antonio L. Cabangon-Chua of Ecoshield Development Corporation is the owner of the said sanitary landfill. Mr. Chua is the president of ALC Group of Companies (9TV-CNN Philippines, Philippine Graphic Weekly, Business Mirror, Aliw Broadcasting Corporation, City Tower Hotel, Fortune Life Insurance Co., Eternal Plans, Inc., Citystate Condominiums, Ecoshield Development Corporation). ^ ""Commission on Audit 2017 Report-Bulacan"". Quezon City, Philippines: Commission on Audit. Retrieved 8 July 2018. Wikimedia Commons has media related to Obando, Bulacan.